Jim McGowan and Bay Shore Softball. 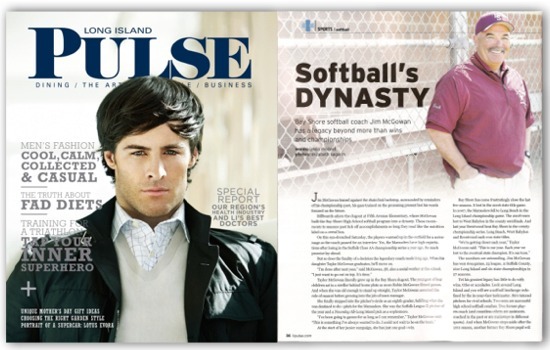 May 2010 issue of Long Island Pulse Magazine. Jim McGowan leaned against the chain link backstop, surrounded by reminders of his championship past, his gaze trained on the promising present but his words focused on the future. Billboards adorn the dugout at Fifth Avenue Elementary, where McGowan built the Bay Shore High School softball program into a dynasty. These monuments to seasons past tick off accomplishments so long they read like the nutrition label on a cereal box. On this sun-drenched Saturday, the players warmed up in the outfield for a scrimmage as the coach paused for an interview. Yes, the Marauders have high expectations after losing in the Suffolk Class AA championship series a year ago. So much promise lay ahead. But so does the finality of a decision the legendary coach made long ago. When his daughter Taylor McGowan graduates, he’ll move on. Taylor McGowan literally grew up in the Bay Shore dugout. The youngest of four children sat in a stroller behind home plate as mom Robin McGowan filmed games. And when she was old enough to stand up straight, Taylor McGowan assumed the role of mascot before growing into the job of team manager. She finally stepped into the pitcher’s circle as an eighth grader, fulfilling what she was destined to do—pitch for the Marauders. She was the Suffolk League II pitcher of the year and a Newsday All-Long Island pick as a sophomore. At the start of her junior campaign, she has just one goal—win. Bay Shore has come frustratingly close the last few seasons. It lost in the 2006 state title game. In 2007, the Marauders fell to Long Beach in the Long Island championship game. The 2008 team lost to West Babylon in the county semifinals. And last year Brentwood beat Bay Shore in the county championship series. Long Beach, West Babylon and Brentwood each won state titles. The numbers are astounding. Jim McGowan has won 609 games, 23 league, 11 Suffolk County, nine Long Island and six state championships in 27 seasons. Yet his greatest legacy has little to do with wins, titles or accolades. Look around Long Island and you will see a softball landscape redefined by the in-your-face taskmaster. He’s tutored pitchers for rival schools. Two sons are successful high school softball coaches. Two former players coach (and countless others are assistants, coached in the past or are mainstays in different sports). And when McGowan steps aside after the 2011 season, another former Bay Shore pupil will succeed him in Jackie Pasquerella. It’s a living legacy that says more about the man than any plaque ever could. His influence will live on long after his accomplishments become forgotten clutter in the trophy cases at Bay Shore High School. Truth is, no one has won more high school softball games in state history than McGowan. And he’s done it his way—equal parts motivational speaker and drill sergeant with a dash of Martha Stewart perfectionism. His gruff act has drawn plenty of critics over the years. The supporters are winning out. McGowan will be inducted into the Suffolk County Sports Hall of Fame on May 6. Back on the field, McGowan gathered his team in a circle and went over a mental checklist before the scrimmage. Preparation is an important ingredient to his success. Little wonder why he owns an incredible .888 winning percentage and the longest winning streak in state softball history (54 wins from 1994-95 with Pasquerella in the lineup). Oh, Jim McGowan has a saying for every occasion. The coach knows the clock is ticking. After three decades of kicking clay, taking on umpires, developing talent and hoisting championship plaques, the end is near. He’ll tackle it on his terms. “I try to emulate what he does and hopefully I can be half as successful,’’ Jimmy McGowan said. He’s already there. Hauppauge reached the Suffolk Class A championship series last season while Plainedge advanced to the second round of the Nassau Class A playoffs. So long as a McGowan is on a softball field somewhere on Long Island, past, present and future remain perfectly aligned. In the span of a week, Hofstra University freshman Olivia Galati experienced the extremes of college sports: The thrill of victory and the agony of defeat. Cliché, yes. But the freshman from St. John the Baptist has enjoyed a season so far removed from stereotypical that bold adjectives don’t do it justice. The young pitcher has Hofstra softball off to a 34-8 start, including an impressive 13-1 mark in the Colonial Athletic Association. Galati was already a Long Island legend after a high school career that began at West Babylon as an eighth grader and culminated with three state CHSAA titles at St. John’s. The two-time NYSSWA player of the year dominated hitters, the way Division I prospects do. But no one – not even Hofstra coach Bill Edwards – expected her to step into the pitchers circle for a Top 25 college program and continue to stifle opposing lineups so completely and consistently. Certainly not as a freshman. It’s been a season of memorable moments and learning experiences. Galati has beaten 18th-ranked Louisville and lost a 3-1 decision to No. 5 Michigan. For a microcosm of her freshman campaign, just look back at the last week. Galati took a two hitter into the seventh inning of a scoreless game against Fordham on April 20. But Fordham, riding a 10-game winning streak, won after Jen Mineau took Galati deep for a solo home run. Pure agony. On Saturday, April 24, Galati bounced back. She tossed a one-hitter and struck out 14 as Hofstra rolled past UNC Wilmington, 3-0. With the win, Galati became the seventh pitcher in program history to win 20 games in a season and just the third to reach 200 strikeouts. Simply thrilling. The 5-foot, 5-inch Galati is 20-4 with a 1.10 ERA and 213 strikeouts in 159 1/3 innings. She is among the NCAA leaders in nearly every category. She is also getting it done at the plate, hitting .261 with 23 RBI, good for fourth on the team. There was a consensus that Hofstra would take a step back this season after losing four-time All-CAA pitcher Kayleigh Lotti to graduation. The Pride finished 26-21 and saw its 11-year run of conference championships end in a 12-inning loss to Georgia State last May. The naysayers are in hiding now. Great pitching will do that. The first-place Pride has eight games remaining in the regular season and can lock up the top seed in the CAA Tournament by winning its series against second-place Georgia State. “We would love to go to the College World Series,” Galati gushed. Hofstra is ranked 28th in the latest ESPN.com/USA Softball poll. Edwards hopes this young team can make a run in the postseason. With Galati pitching, there just aren’t enough adjectives to describe Hofstra’s potential. Sometimes the journey starts off so well, like cake and caviar at a catered affair, and you believe the good times will never end. Abby Morgan and Corrine Gandolfi know this feeling all too well. They were instrumental ingredients as the Hofstra women’s lacrosse team earned just its second ever appearance to the NCAA Tournament. It was May 2007 and Morgan was wrapping up a memorable first season as head coach after three years as an assistant. Galdolfi was the prized freshman recruit from Northport and an instant sensation. Yet three seasons later, Morgan is a veteran coach and Gandolfi her senior leader, and the two are still looking to recapture that elusive magic, still looking to crash the invitation-only affair known as the NCAAs. After two postseason-less springs, Hofstra women’s lacrosse is nationally ranked and a factor once again. The Pride improved to 5-2 with a 17-7 thrashing of Stony Brook on Wednesday, March 17. Gandolfi, a speedy midfielder, poured in five goals and added an assist. Its two losses came by a combined two goals to nationally-ranked Notre Dame and Penn, and were offset by a double-overtime win over No. 20 Rutgers. Hofstra, ranked 19th nationally, travels to face Stanford March 31 before hosting Colonial Athletic Association rival William & Mary on April 9. The Pride head into CAA play with confidence—and an intimate sense of how things can go from right to wrong, oh so fast. Hofstra struggled through a 7-9 season in 2008 and rebounded last spring with a 9-4 start and national ranking heading into the final week of the regular season. Then came back-to-back losses to Old Dominion and William & Mary. It dropped the Pride from first to fifth place and out of the CAA Tournament. Morgan and Gandolfi vow not to take anything for granted this time around. Their focus is on the next ball in the back of the net. Gandolfi isn’t accustomed to losing. She teamed with one of the great school girl athletes to ever hail from Long Island. Jill Byers starred in soccer, basketball and lacrosse at Northport High School and was one year senior to Gandolfi. But while Byers moved on to Notre Dame and became a four-time All-American, Gandolfi proved she could carry a team too. In 2006, Gandolfi led Northport to a Suffolk Class AA title in basketball and a Class A crown in lacrosse. She was named Suffolk player of the year in lacrosse and a Newsday All-Long Island pick. “There was so much competition in Northport, you had to be the best to play,” said Gandolfi, a physical education major. She chose Hofstra because she wanted to stay close to home. The move paid off immediately. Morgan, then the recruiting coordinator and assistant coach, was elevated to the top job. The rookie coach wasted little time in showcasing her top recruit. Her talent was so immense that Morgan moved a senior from midfield to attack just to get Gandolfi on the field. Gandolfi started 11 games as a freshman in 2007 and scored 24 goals, including five in the CAA title game against James Madison. The win gave Hofstra a berth in the NCAA Tournament, something Gandolfi and her teammates have been thinking about ever since. It’s cake and caviar time for Hofstra women’s lacrosse. Gandolfi and Morgan won’t be satisfied with anything less. Shante Evans may be the most heralded recruit in the history of Hofstra University. And midway through her freshman season, she’s playing like it. The 6-foot forward from West Chester, Penn., has transformed the Pride women’s basketball team into a must-see attraction and lifted the program into the thick of the Colonial Athletic Association standings. The high point came Thursday when Hofstra (14-11 overall, 7-6 CAA) downed then-first place Virginia Commonwealth, 74-66. The Pride has won six of its last nine, dating back to an overtime win over UNC-Wilmington on Jan. 17. Evans is a rare game changer as a freshman, leading the team, averaging 13.4 points and 8.9 rebounds. She’s shooting 50 percent from the field and has collected more rebounds (223) and double-doubles (10) than anyone else in the CAA. It’s no surprise. Evans, a 2,000-point scorer and shot put champion at Henderson High School, was the 54th rated prospect in the nation by ESPN, and on Kilburn-Steveskey’s radar since her sophomore year. That long courtship paid off when Evans chose the Pride over Seton Hall, West Virginia, Temple, Drexel, UMass and Penn State. “Hofstra had everything I was looking for in a school. I was close to home, I loved the team and coaching staff and I would get a good education,’’ said Evans, who is majoring in physical therapy. And she’s just what the fourth-year coach needed to help take the Pride to the next level. Hofstra, two seasons removed from a 20-loss campaign, went 16-14 a year ago and was upset in the first round of the CAA Tournament. The Pride reached the WNIT in 2007, its first Division I postseason appearance. And with Evens already owning the low post and getting better by the day, Hofstra has the foundation laid for another postseason run. With five games remaining in the regular season, including a home date Thursday, Feb. 18 at 2 p.m. against George Mason, there’s still room for improvement. The Pride has already proven it can run with the pack. How long will it be before Hofstra leads from the front?